I’ve spent a good part of my adulthood surrounded by boys; sons, friends and nephews. They have kept me grounded and brought a counter balance to all of this girly stuff I do, like sewing and fairy dolls. Having sons has made me sensitive to the male point of view and I make an effort to include images of boys in my artwork, even though it’s easier to depict females. This first picture is from “Vineyard Family”, a piece I made as a naive young mother in 1985 and shows a rather idealized docile child. 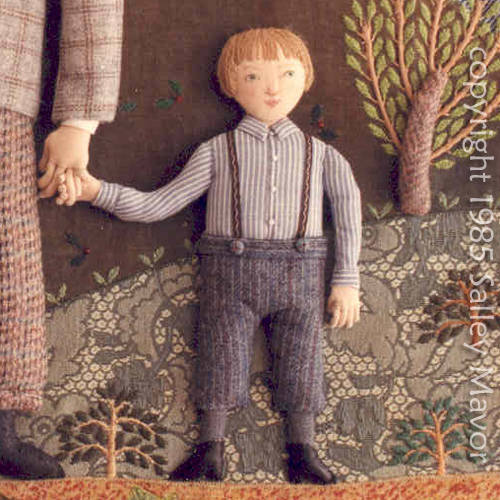 This pair of boys are from “Fall Children” (see more here), which I made 10 years later in 1995. At this point, I’m trying to bring more motion to my figures, perhaps a more realistic reflection of children. Their sweaters are made from cotton socks and their shoes are leather. 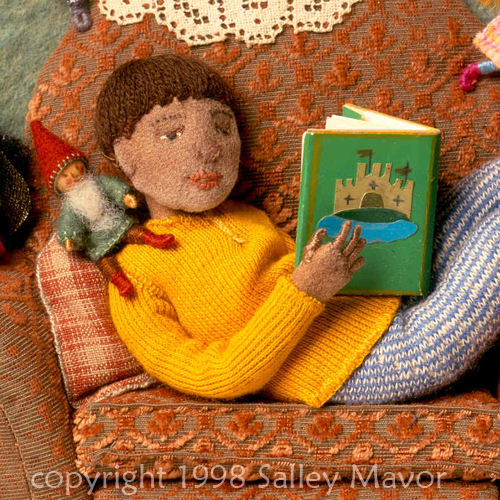 Here’s George reading a book in a chair made from old worn upholstery fabric. His clothing is also made from cotton socks. The full picture can be seen here. This boy sitting in his real stick fort is from my book, You and Me: Poems of Friendship. This is my favorite boy, “Dusty Bill from Vinegar Hill”, an unfamiliar rhyme I found and loved. His hair is made from a spiky acorn cap, which a friend sent from California. Even though I never learned how to crochet, I figured out how to construct his bag using a regular needle. Bill’s in an illustration from my upcoming book, Pocketful of Posies, which you can find out about here. 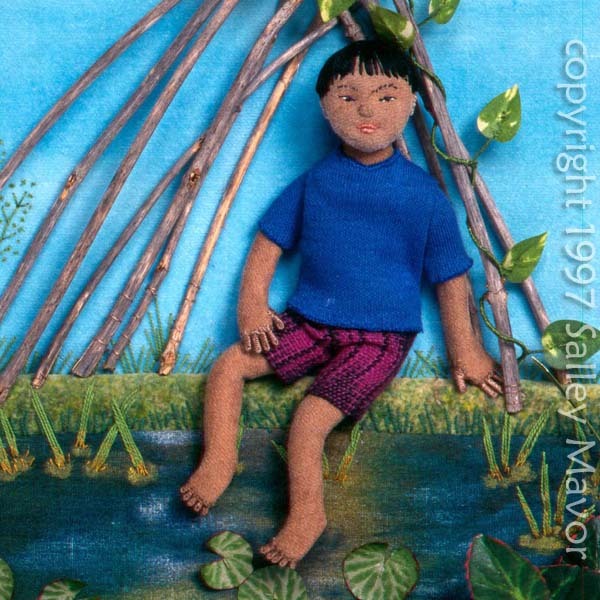 This entry was posted in Children's Books, Closeups, Dolls, Fabric Relief, Felt, illustration by Salley Mavor. Bookmark the permalink. Dusty Bill is my favorite too! I love that you’ve made his hair from a Burr Oak acorn. The ones here always make me think of tiny Tom Sawyer hats. I am such a big fan of yours and was thrilled when I found your blog! 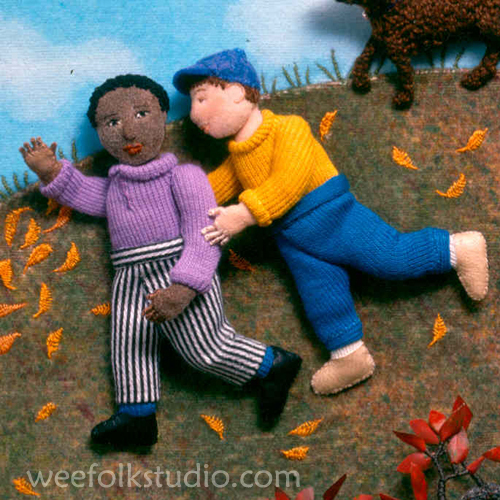 I have Wee Felt Folk- do you have any other instructional books? These little men are absolutely adorable! It’s nice to have you along, Marla. 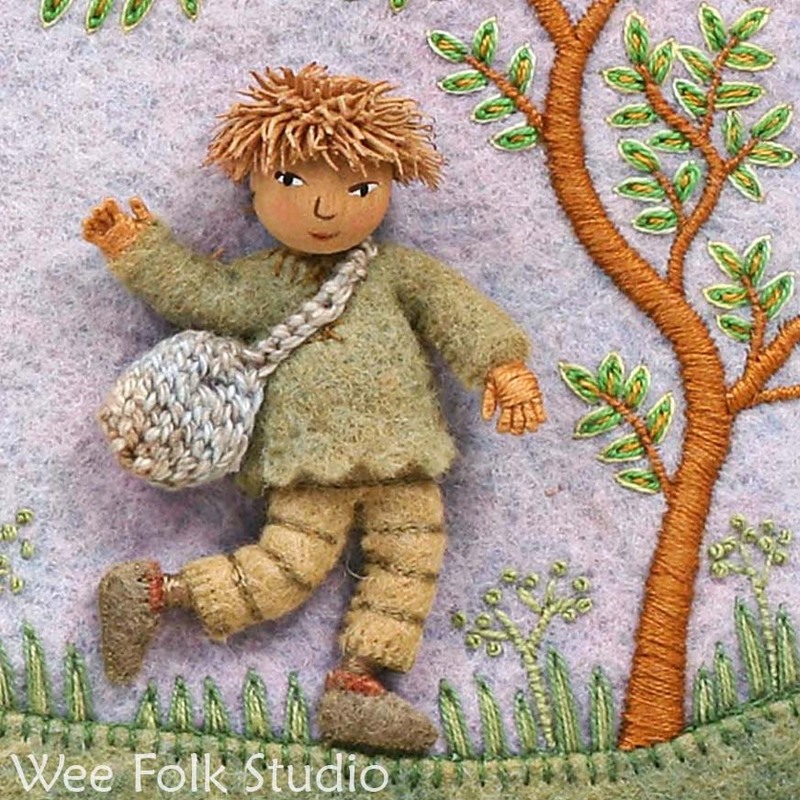 Wee Felt Folk is my only how-to book, which was published 7 years ago. Thanks for your interest. C&T wants me to do another one, but I’ve been too busy. There’s a tremendous amount of work involved in a book like that and just the suggestion of breaking down the process and writing out dozens of detailed instructions makes me want to run in the other direction. For now, I’m focusing on getting my new children’s book launched and arranging exhibits for the artwork. All the boys are wonderful! There are very few boys in the world of doll collecting and dolls so they are truly sought after. Perhaps doll makers didn’t have sons? I love all the boys you made, but the first one has stolen my heart! His expression is priceless. He has a little mischief on that angelic face! You are Sooo Talented.. Your Work just puts me in awe every time I see It…Do You do classes???? Thanks Dee. I have taught some over the years, but lately I’ve been wanting to spend more time working in my studio making things. Love the boys as well. Tapping my toe, waiting, not patiently, for POSIES!! I am astounded!! Your work is brand new to me, and I absolutely love it! It need to have every book. Welcome Jackie. I’m glad you found my blog! Wonderful work. I’m glad to see that your book Wee Folks is back in print! That little guy at the top holding two of Daddy’s fingers tugged on my heart so hard I had to post about him. You can see the little story here: http://needlework.craftgossip.com/more-inspiration-from-sally-mavor/2010/05/17/. I hope the link brings you a few extra clicks. I really love Dusty Bill!